Gold’s on the ropes. Bullion broke below $1,200 an ounce on Monday after losing more than $100 in less than a month as Federal Reserve policy makers land punch after punch by talking up the prospects for a U.S. interest rate rise, reinvigorating the dollar. Bullion for immediate delivery fell as much as 1 percent to $1,199.80 an ounce, the lowest level since Feb. 17, and traded at $1,207.14 at 10:39 a.m. in New York, according to Bloomberg generic pricing. With many traders in Britain and the U.S. away from their desks for holidays, prices that peaked at a 15-month high of $1,303.82 on May 2 are down for the ninth straight day, equaling the worst daily losing run on record, Bloomberg data show. The precious metal declined after Fed Chair Janet Yellen affirmed in comments on Friday what a procession of her officials said earlier last week: that evidence of strength in the U.S. economy meant tighter policy can now be considered. UBS Group AG warned on Thursday that gold is “going to roll over” as the Fed hikes rates twice before the end of the year. Holdings in exchange-traded products ended last week slightly lower after expanding for four straight weeks. The drop has cut bullion’s gain in 2016 to 14 percent from more than 20 percent at the start of the month as Fed officials fleshed out the case for higher borrowing costs. Before Yellen’s remarks, officials including the presidents of the bank’s regional arms in San Francisco, Boston and Philadelphia all spoke in support of higher rates. Bets on a rate hike have risen to 34 percent for June and the odds are more than even for an increase in July, after data on Friday showed U.S. growth picked up more than previously estimated in the first quarter. The dollar spot index climbed as much as 0.3 percent on Monday to the highest since March. 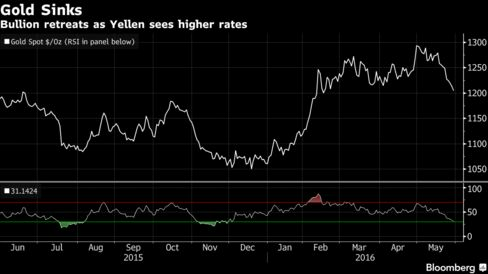 Hedge funds took a breather from gold before Yellen’s comments on Friday. The net-long position in futures and options fell 26 percent to 169,491 contracts in the week to May 24, according to U.S. Commodity Futures Trading Commission data released three days later. Higher borrowing costs damp the appeal of non-interest bearing assets like bullion and strengthen the dollar, making commodities more expensive in other currencies. Among U.S. data due this week, traders will scrutinize non-farm payrolls for this month, which are due for release on Friday. Canada’s two biggest gold producers by market value were among decliners in Toronto trading. Barrick Gold Corp. and Goldcorp Inc. lost more than 0.5 percent as the 21-member S&P/TSX Composite gold index slipped 0.3 percent en route to its first monthly drop since November. Holdings in gold-backed exchange-traded funds fell 2.04 metric tons to 1,842.9 tons on Friday. Silver lost 1.5 percent, platinum slid 0.6 percent and palladium added 0.3 percent.